Oogieloves in The Big Balloon Adventure! 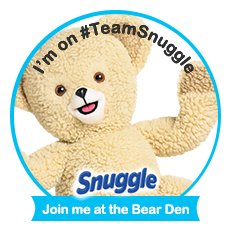 The story follows the Oogieloves - Goobie, Zoozie and Toofie - as they prepare for a surprise birthday party for their friend, Schluufy. When their guardian, J. Edgar, loses the last five magical balloons in all of Lovelyloveville, the Oogieloves take action. Along the way, they meet Rosalie Rosebud (Toni Braxton), Dottie Rounder (Cloris Leachman), Lola and Lero Sombrero (Jaime Pressly and Christopher Lloyd), Milky Marvin (Chazz Palminteri), and Bobby Wobbly (Cary Elwes). 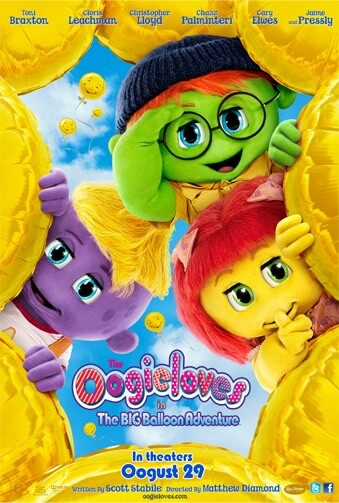 The Oogieloves in the Big Balloon Adventure opens in theaters on Oogust 29th! The Oogieloves in the BIG Balloon Adventure, a film that reinvents the movie-going experience. This film – basically a movie and a live show rolled into one - is the first-of-its-kind interactive family musical that encourages the audience to get out of their seats, dance, and sing. Visual and auditory cues invite the audience to “move” the action along, allowing parents and kids to interact not only with the characters, but also with one another. 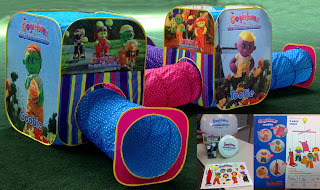 Giveaway~ one LUCKY winner of Dnbuster's Place will win a PRIZE Pack valued at more than $150! disclosure~ The Oogieloves prize pack and information have been provided by Oogieloves. No compensation was received. My kids are too old for this movie but my grandson will love it! If it comes out by us, then yes! I just saw the poster when we went out for date night, and thought that Dorothy and Lilly would just love this. The prize package would hit the spot just right here in our home. Thank you. I will take my daughter if the movie is at a theater near us.